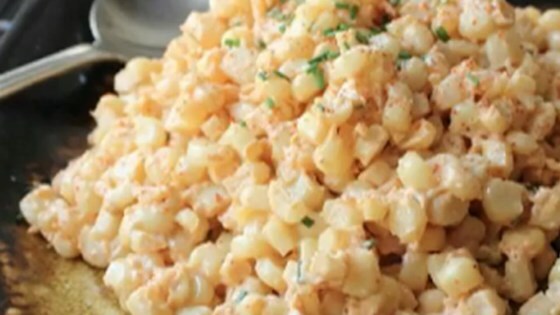 "This is my new favorite corn side dish. You're going to be so shocked that without butter, without heavy cream, you're going to have a delicious corn side dish that's every bit as rich and decadent, and it's going to be significantly lower in calories." Husk the ears of sweet corn and stand an ear upright in a skillet with the top pointing up. Use a sharp kitchen knife to slice off the kernels, working from top to bottom and rotating the ear after each cut. Use the back of the knife to scrape extra juices into skillet. Repeat with remaining ear of corn. Drizzle olive oil over the kernels and sprinkle with salt; place over medium heat and cook until corn is hot, about 3 minutes. Add garlic; continue to cook and stir until fragrant, about 1 minute. Season corn with cayenne pepper, smoked paprika, and garam masala. Cook and stir until corn is tender, about 2 more minutes. Reduce heat to low and stir Greek yogurt into corn mixture. Remove from heat, stir in chives, and season with more salt, if desired. This rich, creamy corn side dish has no cream or butter. If cutting the kernels into a bowl, use an overturned ramekin in the bottom of the bowl to raise the cob up for easier cutting. First saw this on Chef John's blog. What a terrific way to use late summer sweet corn. Delicious! I is sweet sweetcorn. I would try some lime juice on it vs. salt. Awesome! The best corn I've ever had. The family loved it didnt use the gram marsala or whatever but everyone loved it! !